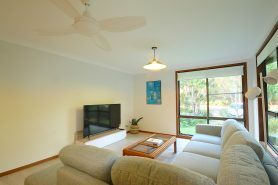 Now is the time to visit Byron Bay and stay in one of our great Byron Bay holiday houses. We have a selection of beach, luxury and pet friendly holiday homes, Byron Bay Apartments and motel accommodation, so something for everyone. Book now and visit Byron Bay before the busy Christmas holidays when accommodation is scarce and expensive. A holiday house is the perfect launch pad to experience what the town of Byron Bay has to offer, from great beaches, scenic lookouts both coastal and hinterland which can be accessed by bushwalking tracks or more tourist friendly walkways depending on your motivation. A bounty of quality restaurants and cafes with a large range of arts and craft stores and markets can be found throughout the area and around the town. Having a great climate and relaxing atmosphere, you will be spoilt for choice with a visit to Byron Bay. A holiday house is the ideal choice for the family or a group get together with some of our bigger properties like Come by Chance sleeping up to 10 people. Byron Bay also has a number of free things to do such as taking a walk to the lighthouse to see the sunrise or take a dip in our beautiful crystal waters, sun bake or surf at the many beaches, stroll the streets of Byron Bay window shopping, people watching while listening to some of the many talented buskers. Some other exciting things to do include hot air ballooning, sky diving, hang gliding, learning to surf or take a kayak tour. Byron Bay also has an array of pubs and clubs but also boasts a great family friendly environment and has something for everyone. So book your Byron Bay Holiday house with us now before the Christmas rush and come make up your own mind about why Byron is becoming such a popular holiday destination.